The perfect hybrid between a 210mm and 255mm sliding mitre saw. The R210SMS-300+ maintains a more compact and robust design of a 210mm model but with the 300mm cross cutting capacity of it's bigger 255mm brother. Equipped with 'PLUS' model features, this is the ultimate cutting solution for any trade. 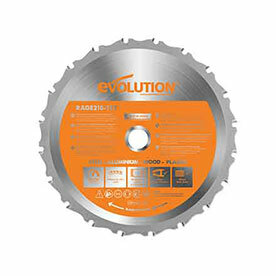 Accurate cutting with laser guidance, smooth sliding functionality, adjustable depth of cut and 9 positive mitre stops. Reliable smooth square cutting every time in a variety of materials. 0° - 45° bevel tilt and 50° - 50° mitre covers all common cutting angles. The R210SMS-300+ has an impressive 300mm slide capacity, allowing a greater cut capacity for wider materials, compared to a 230mm slide on the R210SMS+ model. Premium Japanese Tungsten-Carbide-Tipped (TCT) 210mm blade included. Dual Quick-Release clamps included for additional accuracy & faster adjustments. Cleaner & safer working environment with dust collection bag & dust port adaptor included for use with vacuum extraction. Integrated carry handles - easy to carry & transport around the workplace. 3m power cable reduces the need for extension leads. Sorry, this function is currently unavailable. Please try again later.